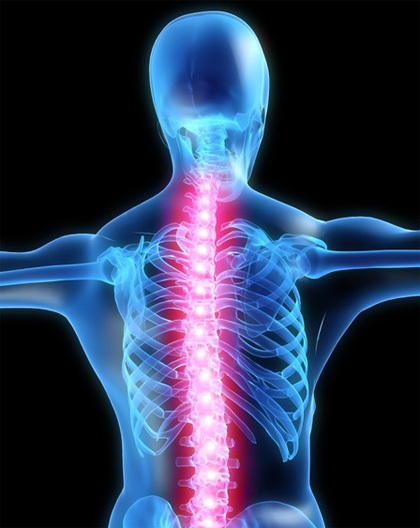 Spinal X-rays are taken to find injuries or diseases that affect the discs or joints in your spine. These problems may include spinal fractures, infections, dislocations, tumors, bone spurs, or disc disease. Spinal X-rays are also done to check the curve of your spine (scoliosis) or for spinal defects. X-rays are a form of radiation, like light or radio waves, that are focused into a beam, much like a flashlight beam. X-rays can pass through most objects, including the human body. Dense tissues in the body, such as bones, block (absorb) many of the X-rays and look white on an X-ray picture. Less dense tissues, such as muscles and organs, block fewer of the X-rays (more of the X-rays pass through) and look like shades of gray on an X-ray. X-rays that pass only through air look black on the picture. Cervical spine X-ray – This X-ray test takes pictures of the 7 neck (cervical) bones. Thoracic spine X-ray – This X-ray test takes pictures of the 12 chest (thoracic) bones. Lumbosacral spine X-ray – This X-ray test takes pictures of the 5 bones of the lower back (lumbar vertebrae) and a view of the 5 fused bones at the bottom of the spine (sacrum). Sacrum/coccyx X-ray – This X-ray test takes a detailed view of the 5 fused bones at the bottom of the spine (sacrum) and the 4 small bones of the tailbone (coccyx). The most common spinal X-rays are of the cervical vertebrae (C-spine films) and lumbosacral vertebrae (LS-spine films). Find the cause of ongoing pain, numbness, or weakness. Check for arthritis of the joints between the vertebrae and the breakdown (degeneration) of the discs between the spinal bones. Check injuries to the spine, such as fractures or dislocations. Check the spine for effects from other problems, such as infections, tumors, or bone spurs. Check for abnormal curves of the spine, such as scoliosis, in children or young adults. Check the spine for problems present at birth (congenital conditions), such as spina bifida, in infants, children, or young adults. Check changes in the spine after spinal surgery. Are or might be pregnant. The risk of radiation exposure to your unborn baby (fetus) must be considered. The risk of damage from the X-rays is usually very low compared with the potential benefits of the test. If a spinal X-ray is absolutely necessary, a lead apron will be placed over your belly to shield your baby from the X-rays. Have had an X-ray test using barium contrast material (such as a barium enema) in the past 4 days. Barium shows up on X-ray films and makes it hard to get a clear picture of the lower back (lumbar spine). You don’t need to do anything else before you have this test.